This page was published on 24 February 2016. 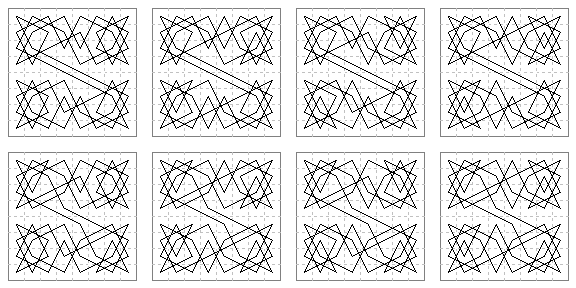 There are 36 partial halfboard tours of squares and diamonds type: Internal end on: a-file 12, b-file 6, c-file 6, d-file 12, External ends in top or bottom rank, shown here as two to a panel. The internal link in the upper halfboard tour can be any of the six slants marked with a round spot at one end and a square spot at the other. 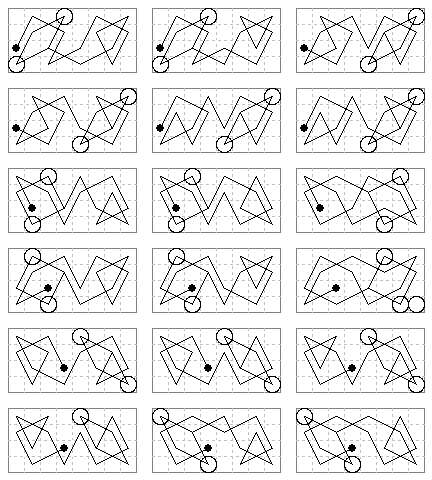 There is then one or more 15-move paths connecting each end of this link to the similarly marked circled cell in the bottom rank. 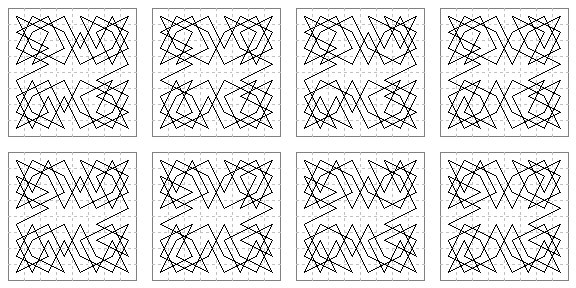 The number of paths available (1, 2 or 4) is shown above the spot. The number of tours using the link (2, 4 or 8) is the product of these two numbers and is shown at the top, above the link. These add to 26 in the first case and to 28 in the other two cases, totalling 26 + 28 + 28 = 82 tours. 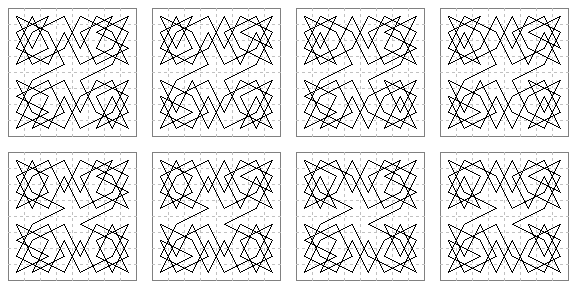 There are three symmetric linkages between the half-boards, Narrow, Medium and Wide, according as the links are separated by 1, 3 or 5 units. It seems somewhat anomalous that the links in the Narrow case slope down to the right while the wider cases slope in the opposite direction. A tour with half-board linkage a-c, b-d, c-e can of course be reflected left to right to show respectively linkages f-h, e-g , d-f instead, but sloping the other way, but the links between the two halfboards are also reflected and slope the other way. 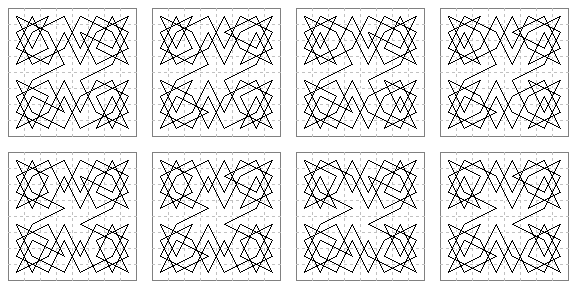 Diagrams of the 82 symmetric double halfboard tours of squares and diamonds. Within each panel the tours are grouped according to central angles, and secondarily according to the angles at b7 and g7.